Over time grout and caulk in bathroom areas become hard. With regular house movement grout will crack and holes are formed. When your shower has cracks in the grout and caulk, mold and mildew forms within them. If not taken care of, you may be reducing the life expectancy of the shower. Every time you shower, water gets in the cracks. The sheetrock behind the tiles soaks up the water, causing the shower walls to get spongy and that leads to larger problems. When you see mold or mildew in the cracks, it is growing from behind the caulk and grout line. No matter how you scrub it does not come out. It is best to treat this immediately. If left untreated, water will get further into the shower walls and tiles will pop off. To repair the shower at this point is expensive. 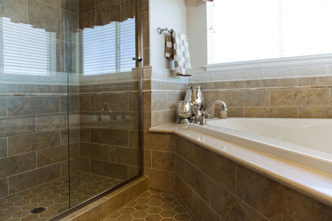 Steam clean your shower to get all of the soap scum off of the tile and grout. Scrape out the cracked and mildewed areas. Apply fresh caulk and repair grout issues. Seal the shower for maintenance. For more serious issues such as spongy walls, we offer services to replace damaged sections, walls and re-tile as needed. 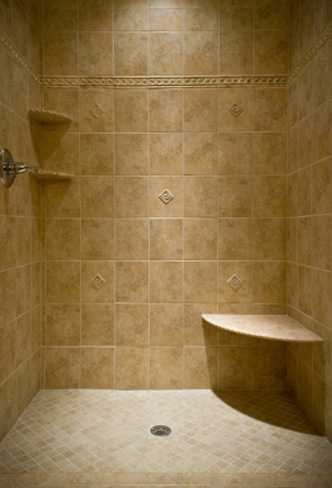 Ridge Meadows Carpet Care / Tri-City Carpet Care can also take care of all types of stone showers. We clean and maintain Travertine, Marble, Granite and Slate bathrooms. That includes any caulk, issues around sinks and tubs, as well as kitchen countertops. We provide service for all of those surfaces.